First posted in June, 2016. Updated in 2018. I taught a small, intimate two-hour crochet class in my favorite Sarasota yarn shop today. It was a test of a few ideas I have for next month’s Stitch Games class in Charleston. A few days ago I imagined using the popcorn stitch to show one way to group colors of a bold variegated yarn. I’m glad I crocheted a swatch in time for this class. It was perfect. I think I’ll turn it into a summer handbag. Some of the students were surprised that you could get the look of alternating two or more yarns with just one yarn. I hadn’t thought of this advantage, but it’s true. Sometimes, alternating different strands of yarn in a project interrupts the crochet flow, so that’s why this is an advantage. It’s nice to have this built in option with just one ball of yarn, if you know how to do planned pooling. Simple rows of double crochets (UK: trebles). Susie, a student in today’s class, crocheted this swatch. It’s color-stacked double crochet. Susie is actually the resident crochet teacher for the shop! Isn’t it beautiful? You can use a taller crochet stitch like the double crochet (dc) if each color in a variegated yarn is long enough. In this swatch, the yellow is barely long enough for one full dc, but it looks cool the way it shades into the green, doesn’t it? For the handbag I used half doubles (hdc or UK: htr) for the aqua, and dc for the peachy popcorns. The yarn I wanted to use for the Jempool Scarf pattern had shorter colors, so I used (soft, loose, stretchy) slip stitches. You can see another color-stacked slip stitch project at the top of this page. Both of these yarns are exclusive custom colorways hand dyed for this Sarasota yarn shop, A Good Yarn. I’ve used several of their custom yarns for class samples: Seshen, Bonefish, Bare Bones, Tunisian Spoonbill, and Slip Stitch Ikat Cowl. 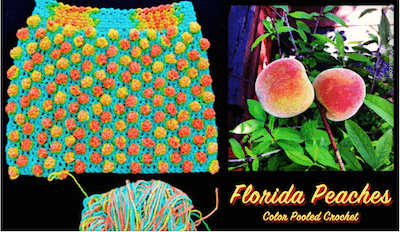 I’ve tested many CGOA crochet class topics at A Good Yarn over the years, and a subtropical theme always seems to work well 🙂 The handbag looks just like Florida peaches against the Florida sky.